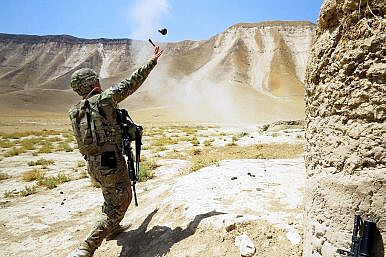 A U.S. soldier throws a M67 fragmentation grenade during skills training at Kunduz province, Afghanistan (July 3, 2013). Reported earlier in The Diplomat, it appears the Taliban are making another strategic run at Kunduz city. The strategically vital and populous city, which fell to the Taliban for 15 days last fall, is now once again under siege. Over the past 48 hours, key villages surrounding the city temporarily fell to the Taliban. A stone’s throw away from the city gates, Khanabad district fell on the morning of August 20 to the Taliban as weary Afghan forces short of supplies began to push back to the Kunduz city center. Soldiers blamed the lack of coordination and supplies on the collapse of the district. One soldier, Mohammad Hashim, stated, “Two local police commanders were fighting each other in Khanabad district which allowed the insurgents to attack us and we lost the district.” Another soldier said, “It has been three days of fighting for us – on empty stomachs. We do not have food and our supply route has been cut off by the Taliban.” Others also blamed the poor performance on the dispute between President Ashraf Ghani and CEO Abdullah Abdullah, accusing the two leaders of ignoring national security issues while furthering their personal feud. Qala-e-Zal and Ali Abad villages are also contested. “War is going on in Imam Sahib district and Dasht-e-Archi and Chardara, battles expanded in and around Khan Abad and Qala Zal,” said Assadullah Sadat, a member of the Kunduz provincial council. “It seems that last year’s tragedy is going to happen again,” said another member of the council, Safiullah Amiri, a reference to the collapse of Kunduz city last year. The Taliban over the weekend have managed to cut off all roads leading into Kunduz. However, as reported by Tolo News, Afghan security forces managed to reopen the Baghlan-Kunduz highway on Saturday. This road serves as a vital corridor linking Kunduz and Kabul and acts as a main artery for sending supplies and reinforcements to the embattled city. The temporary collapse of Khanabad has displaced hundreds of families and stoked fears that the provincial capital may fall once again. Many of the villagers headed toward Kunduz airport and neighboring Takhar province to escape the violence. Though Khanabad district has been recaptured by Afghan commando forces that arrived in the district on Saturday, the situation surrounding Kunduz remains tense. The Afghan government may also be preparing for another collapse of the city, as Muslim Shirzad, a reporter for Tolo News, tweeted out on Saturday that the Afghan government was relocating Kunduz prisoners to the airport. The report highlighted fears of a playback of last year’s collapse, when the Taliban opened up Kunduz jails to refill their ranks. According to Maj. Gen. Mohammad Zaman Waziri, Afghan Army 201st Corps commander, A29 Super Tucanos –Afghanistan’s new propeller based fixed wing close air support platform — are in the area assisting ground forces. Afghan forces continue to press operations to relieve the beleaguered provinces of Baghlan and Kunduz. Sunday night Afghan Special Forces conducted raids in Dahan-e-Ghori area of Pul-e-Khumri in Baghlan. The unit destroyed six Ford ranger vehicles captured by the Taliban and captured a local Taliban leader in charge of financing operations. Aliabad district on the outskirts of Kunduz still remains contested, with reports that the Taliban have closed the portion of the Baghlan-Kunduz highways that runs into the district. U.S. airstrikes have been reported in the area, with the Ministry of Interior claiming 22 Taliban and two commanders were killed in the strike. Insurgents also managed to destroy a key bridge—the Alchin Bridge—that connects Kunduz city with Imam Sahib and Dasht-e-Archi districts.